Prebiotic preB uses fermenation process. Why does preB (Prebiotics) use fermentaion? Living food is delivered via fermentation of prebiotic preB. Revolutionary Fermentation Developed from Time-Honored Traditions. preB's Secret to Delivering Vital, Living Foods. There is wisdom in time-honored traditions. When used in novel, new ways, the result can be revolutionary. That is the new, revolutionary tradition of preB (Prebiotics). To create for you the highest level of concentrated nutrients, preB (Prebiotics) is fermented. But this is no ordinary fermentation. So why is preB (Prebiotics) fermented? And what makes preB's fermentation revolutionary? Why Does preB (Prebiotics) Use Fermentation? The plant-derived preB (Prebiotics) formula, utilizing 50+ carefully selected ingredients, is rich in phytonutrients and is processed by natural fermentation. Fermentation is Nature's own method of food processing. It precedes recorded human history. Over millennia, cultures around the world mastered fermentation to create and preserve foods. Fermentation has also been the traditional method for making some foods edible, as with olives, and for making flavor enhancers. 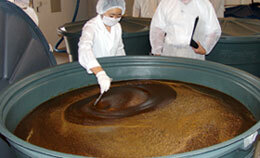 Fermentation is a natural method of concentrating raw food materials, and preserving them. The phytonutrients from the 50+ of preB (Prebiotics) ingredients are not only retained but enhanced, making them more easily absorbed by your body. Unlike ordinary food processing, fermentation also improves the overall nutritional value of the food adding new nutrients and making them easy to digest. More importantly, fermentation reduces toxins and anti-nutritive byproducts. This beneficial result is greatly facilitated when very pure water is used in the fermentation process. The fermented preB (Prebiotics) food is the ultimate prebiotic health booster. The paramount importance of prebiotics is now recognized for its complementary health effects“ promoting overall and intestinal health, strengthening the immune system, and boosting the effectiveness of probiotics (beneficial bacteria). This amazing product was developed over dozens of years. preB (Prebiotics) is unique. Revolutionary“ it is based on ancient traditions. 1. Learn about the revolutionary fermentation technique preB (Prebiotics) uses. Click here. 2. See the uniqueness of preB's Three Step Fermentation here. 3. Discover how fermentation is crucial to your health when it happens in your body.